The State Scenic Highway System is a list of highways, mainly state highways, that have been designated by the California Department of Transportation (Caltrans) as scenic highways. The California State Legislature makes state highways eligible for designation as a scenic highway. For a highway to be declared scenic, the government with jurisdiction over abutting land must adopt a "scenic corridor protection program" that limits development, outdoor advertising, and earthmoving, and Caltrans must agree that it meets the criteria. The desire to create such a designation has at times been in conflict with the property rights of abutters, for example on State Route 174. 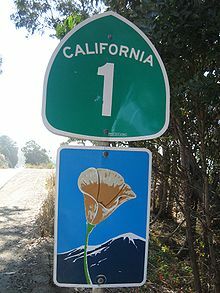 Scenic highways are marked by the state flower, a California poppy, inside a rectangle (for state-maintained highways) or pentagon (for county highways). 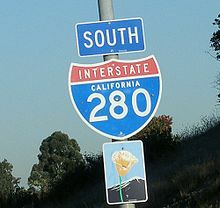 California Department of Transportation (September 7, 2011). "Officially Designated State Scenic Highways and Historic Parkways". Sacramento: California Department of Transportation. Retrieved October 21, 2017. ^ Lech, Steve (2012). For Tourism and a Good Night's Sleep: J. Win Wilson, Wilson Howell, and the Beginnings of the Pines-to-Palms Highway. Riverside, CA: Steve Lech. p. 230. ISBN 978-0-9837500-1-7.